Style, comfort and utility come together in the Cinto chair, a stackable office chair that breaks the number one rule for stacking chairs: it's comfortable. Like Humanscale's ergonomic task chairs, Cinto was built to support the human body by minimizing pressure points and discomfort. Developed in the Humanscale Design Studio by a global team of designers and engineers, Cinto puts comfort first. 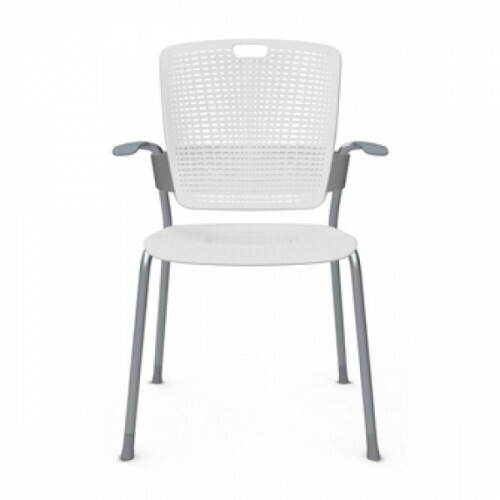 As well as offering unrivaled support in a streamlined aesthetic, its lightweight recycled construction makes carrying and storing the stackable chair effortless. Thanks to an innovative ergonomic design and floating backrest technology, Cinto supports the sitter’s lower back, offering automatic lumbar support unlike any other stackable office chair. With a built-in handle, Cinto can be easily carried and stowed. Small offices can save space by stacking six freestanding Cinto chairs together, or up to 15 with the optional Cinto Dolly. Cinto features an innovative backrest that provides recline and automatically adjusting lumbar support, plus a seat pan design that uniquely distributes the sitter’s weight to reduce pressure points. Available in an array of colors, Cinto complements any residential or commercial interior. Made from lightweight recyclable materials, Cinto’s design also helps to reduce shipping weight and create a smaller carbon footprint. Proven to be environmentally sound, Cinto is certified by GREENGUARD and level®, and contributes to valuable LEED credits. Created by the Humanscale Design Studio, the Cinto chair was engineered to make stackable seating practical, functional and, most importantly, comfortable. Bringing ergonomics principles to the design, the team built a chair that offers automatic support for every user. Its easy-to-stack design makes it the perfect accompaniment to any environment. Stylish functionality is at the core of Cinto. It is available in wide range of color options and finishes to complement its environment. These stackable conference chairs stack vertically for space-saving storage. No matter how many chai..